Can you see my pink flamingos in the background? Those are the ones the dogs bought me for Mother’s Day. Still loving the pink little guys. What’s better than a bird who sits still for photos? And doesn’t poop all over your porch? I love coral bells. I keep meaning to get some, but like everything else, never get around to it. 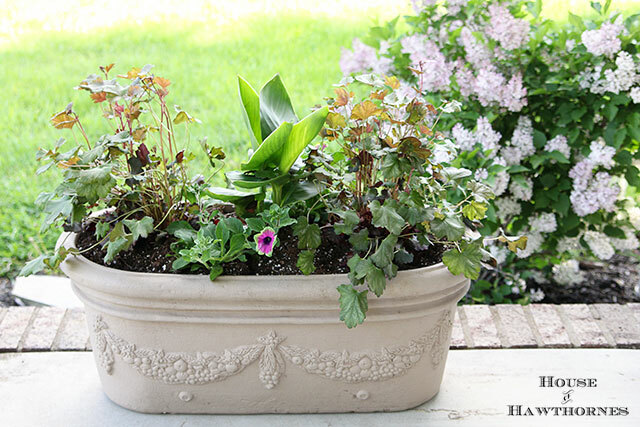 Your planter is gorgeous, Pam! I have those same petunias in 2 of my planters and mine look like the wind has torn them to bits. Maybe it has! Yours have already matured into a beautiful arrangement. Could you send a little sun my way, please? Coral bells are my favorites. Love those tiny blooms. Happy almost weekend. Cheers to those flamingos. A fine job you have done. to have a bird like yours! I love seeing how crazy planters can go! 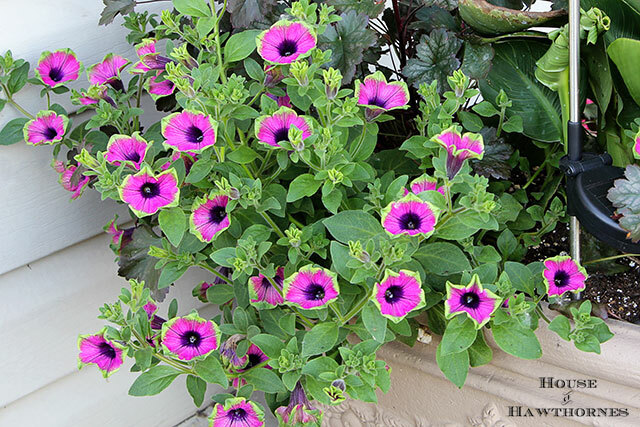 I bought that same Petunia with the green edges–thought it was so different. Mine are growing like mad too! What a great combination! Love the heuchera’s purple leaves against the brightness of the supertina. 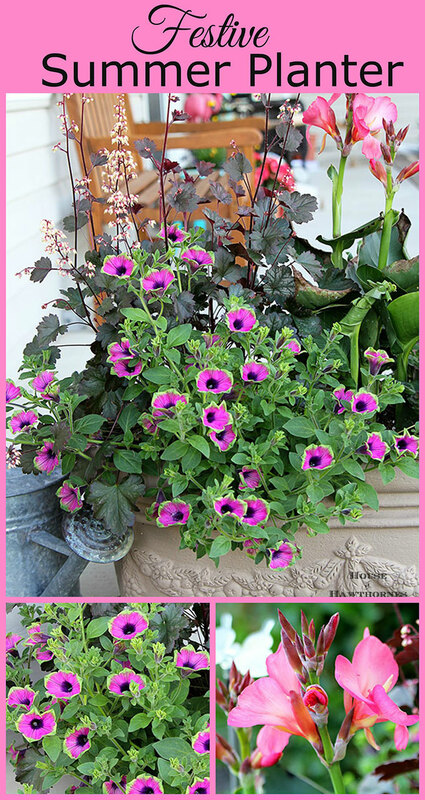 I love those petunias, and the Flamingos. My precious nephews bought me a couple for our anniversary but they have faded in the sun. I plan on finding some flamingo pink spray paint and brighten them up. Yay! I was able to leave a comment. I have tried for several days to comment on your posts, for some reason it wouldn’t work. Love the supertunia and the heuchera together. Love the shape of that planter and those supertunias are just gorgeous! Beautiful photos. 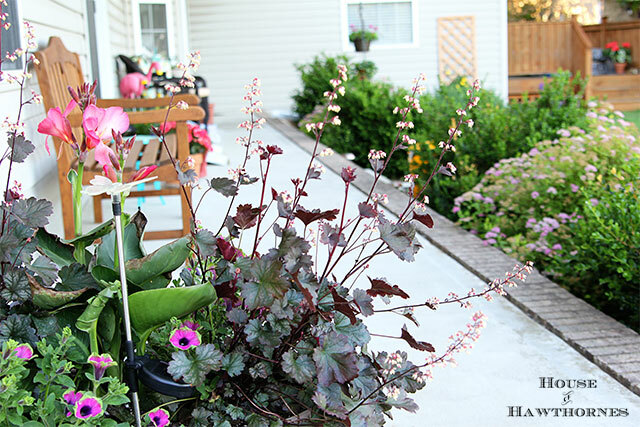 Love your front porch and all these ideas for what to plant together. You have so much information here. Thanks. 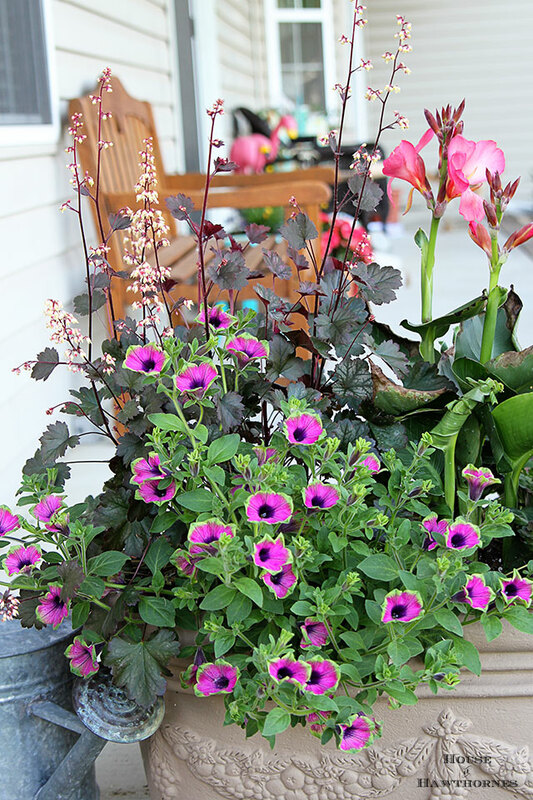 Beautiful flowers and very nice planters. Thank you for sharing. 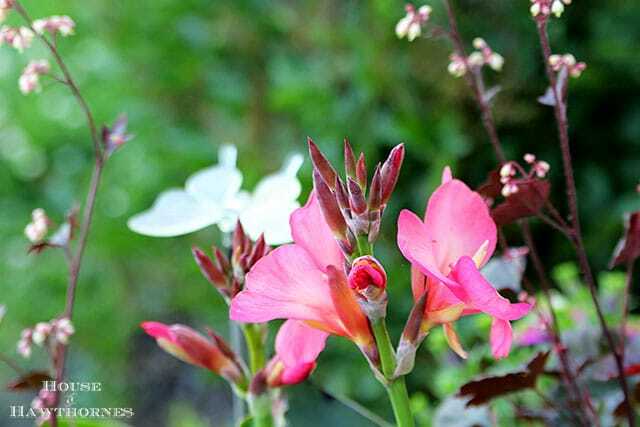 If you love pink, this Canna is the perfect choice! 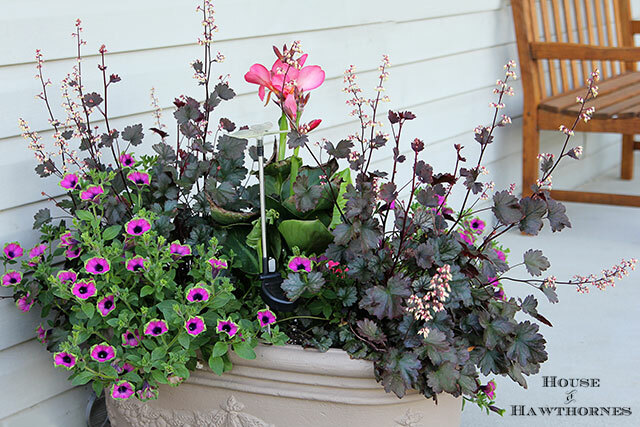 Deep, crimson-pink blooms add bold color to the summer garden. 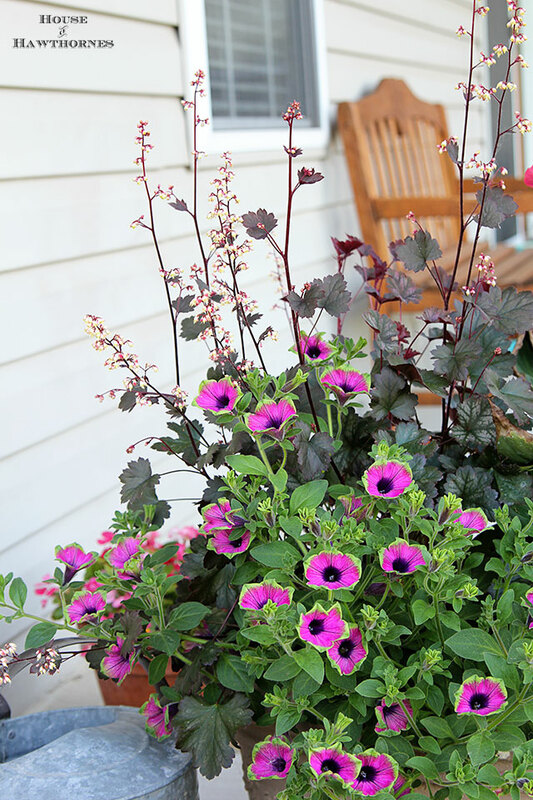 This deer-resistant beauty thrives in full sun and can be planted both in the garden and containers.